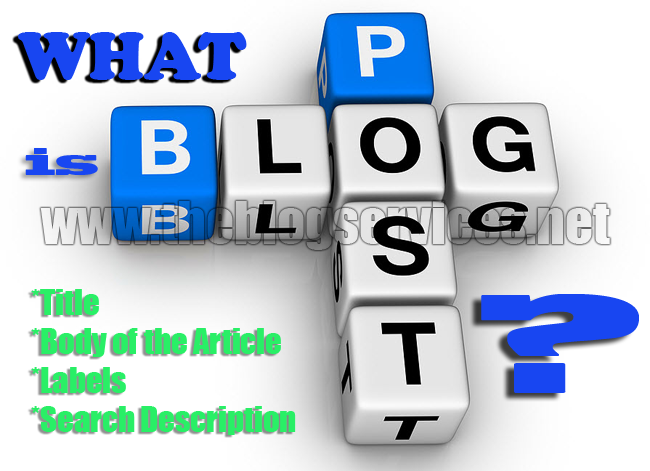 Home » Blog Labels » Blog Post » Blog Post Title » Blog Search Description » blogging for the beginners » blogging tips » Body of the article » What is a Blog Post? In your blogging journey, you will get to encounter a lot of blogging jargons that will serve as your main language online. Every field of work has its own jargon and so is blogging. This time, you will get to know about blog post and I bet you might have heard about this already and if this is your maiden voyage in blogging, this might sound strange to you so let me explain this. In Blogger dashboard, you will get to see on the left side menu the word “post” and clicking this will lead give you a list of posts that are either “published” or in the form of “draft.” All of those are blog posts but you should know the distinguishing factor between a published and unpublished post “draft” because your goal is to let others read about what you have written and not just let it stay in your draft. To have a quality blog post, you have to acquire experience in writing and this is polished along the way. Sooner, your encounter with other blogs that are already established and with pool of writers will make you vigilant of how to create a quality blog post. Blog posts are the products of what you believe, tried and have thought of that are published through your blog. In other words, it’s a matter of knowing where the article was published that will give you an idea on how to understand what is a blog post. Title – a blog post has a title that will appear in the search engine and can also be a part of the link that will propagated. A relevant title is required if you would like to boost the performance of your post. Body of the article – this is the main content of the article that comes with different topics. Choosing your topic in writing is essential to creating a post. Labels – labels are keywords that are placed to describe the article and can also be the magic word to land on the blog post through the search engines. Manipulation of this settings is on the right side “post settings” of the blogger platform while creating or editing posts. Search description – put this if you would like to give value to your post that will appear also on search engines. This is similar to meta description that is essential in giving a formal definition of what your blog post is all about. Other parts of the blog post are the permalink, location, publishing date, and other miscellaneous options. It is good to have a blog post that is planned well because everything that you put in it will matter in the end. If you are new to blogging, I advise that you should do your post in a manner that is organized for the readers to appreciate and easily get your point of writing. These are the essential things that you need to know to understand what a blog post is.